As part of the Science and Conservation team, you'll have the opportunity to live up to the Garden's commitment. For more information about jobs, please visit our Open Positions page. You can also be a part of the Garden's research team through graduate and undergraduate programs as well as fellowships. 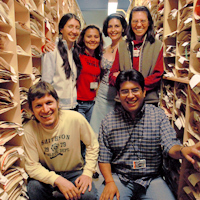 Fellowships at the Garden are often available to professionals who have received at least an undergraduate degree in the field of botany/plant sciences from universities, governmental and non-governmental institutions and organizations in Mexico, Central America, South America, Madagascar, Vietnam and Tanzania. Research fields are limited to plant systematics, biogeography, ecology and conservation.